The Islamic State militant group (IS) is fighting on many fronts against those seeking to defeat it. One of those fronts is a digital one. Its use of social media has been thrown into the spotlight again after it used messaging app Telegram to claim responsibility for Saturday night's terror attack in London. IS puts media warfare on a par with its battle on the ground and often glorifies "media martyrs" - people who are killed while creating videos and other digital content for the group. Like many other such groups, IS has been an enthusiastic user of social media and the web, broadcasting propaganda about its successes and using it as a recruitment tool. Although a long-time user of social media, IS activities took a significant turn in September 2015 when the group's official media outlets took to Telegram. The move to the encrypted messaging service came after a long-running conflict with Twitter, which regularly shut down IS accounts, and some experimentation with less well-known platforms from which it was also expelled. The timing was significant because that was the moment when Telegram set up the "channel" feature, letting users broadcast to an unlimited number of other users - a tool that many online jihadists were quick to exploit. The move to Telegram did not go unnoticed and IS went underground in August 2016 after its official accounts were repeatedly suspended. But IS media operatives set up lots of separate channels that simply repeated or mirrored what appeared on the official channel. These channels simultaneously stream material produced by IS's central media operation, including its self-styled news agency Amaq, and are described as being dedicated to distributing official IS news. The mirror channels, called the Nashir News Agency, have also regularly been suspended. To circumvent this, their administrators use a stealthy approach in which they set up a user or channel and allow it to build up a substantial following before suddenly switching it to the easily recognisable IS mirror brand. The channels continuously promote new join-up links for their proliferating replica versions, calling on IS supporters to distribute them further. Some channels, whose promotion on popular social media platforms is prohibited, are designed to maintain a lower profile to avoid suspension. This enables them to attract a significant number of followers but the channels are usually removed before this exceeds 1,000. Such numbers suffice to get IS's message out for distribution by online supporters. Prominent pro-IS figures reliably stream the group's propaganda alongside other content. But IS's strong media branding renders the group's material easily recognisable among other fare. This was seen on Sunday, when the IS news outlet Amaq said on Telegram that "a security unit of Islamic State fighters carried out the London attacks of yesterday". Telegram does not allow comprehensive searches of public content, which means that the number of pro-jihad users cannot be accurately gauged. In mid-April, the Nashir agency published a poster congratulating itself on setting up 100 mirror accounts - and there are now said to be more than 130. This was shortly followed by a campaign to celebrate 12 months of Nashir agency's operation. As part of the campaign, the outlet called for admirers and readers to send in articles and images praising its work, which they did in large numbers. These promotional campaigns appeared to be an effort to buoy morale among IS supporters who enjoy relative freedom to post material on Telegram. The BBC has asked Telegram to comment on IS-related activity on its service but has not received a reply. Telegram has advertised its daily efforts to take down pro-IS channels since December last year. In another recent move, Nashir agency has switched from just being a mouthpiece for IS to urging its followers on Telegram to spread content via Twitter and Facebook. It has advertised its own accounts on those platforms, which have repeatedly been suspended. It has also launched accounts on Instagram and set up English-language feeds for the first time. The outlet now posts IS material in Arabic and English translation via its main feeds - the latest step of an initiative to post in English that began after the Westminster attack on 22 March. These moves by Nashir agency to expand its reach have followed criticism by IS supporters on Telegram that pro-IS channels were preaching to the converted and should step up their efforts on other platforms. IS has sought to cultivate the commitment of virtual foot-soldiers by highlighting their importance in its war. Charlie Winter of the International Centre for the Study of Radicalisation and Political Violence (ICSR) acknowledges the success IS has had with Telegram. He says the messaging service's action against pro-IS channels "seems to be very haphazard". Home Secretary Amber Rudd has also named Telegram among tech firms she wants to be tougher on pro-jihad users. Mr Winter adds that IS's efforts to expose unsuspecting audiences to its propaganda on other, more popular platforms now meet with much less success. IS might regularly post content specifically designed for Twitter, but this attempt at "amplification" no longer goes well, he says. 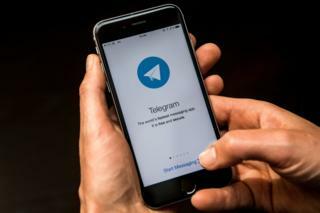 The group is still most successful on Telegram but its reliance on it could come at a cost, as supporters flock to the app instead of pushing the IS message to audiences elsewhere.